The 2009 annual coordination meeting to discuss the Buckhorn Mines took place at the Eagle Cliff Grange on the bank of the Kettle River on March 17th. Final monitoring reports were distributed to the agencies and OHA on March 3rd. OHA’s consultant, Ann Maest of Stratus Consulting, presented our review of the documents along with an independent review of the monitoring data. OHA offered recommendations regarding water treatment, streamflow comparison, capture zone, development rock, the Kettle River Facility, discharge monitoring reports and composite database as well as the timing of the next annual reports. The purpose of the annual coordination meeting is to review the hydrogeologic and water quality monitoring of the mine and suggest modifications to plans that will help ensure protection of the environment. This year’s evaluation is based on Water Year (WY) 2009, which began on September 31, 2008 and ended on October, 1, 2009. WY 2009 reports were much improved over last year’s reports. The reports were well organized and for the most part addressed the issues directly, spelling out the requirements early. Shortly after last year’s annual meeting, numerous violations, orders and a $40,000 fine were issued to Kinross/Crown for various water quality violations and failure to maintain the mine’s capture zone. The violations and orders continued until August when improvements to the Water Treatment Facility were implemented. Since that time no violations have been issued. On May 14, 2009, Washington State Department of Ecology issued a draft modification NPDES (National Discharge Elimination System) permit and fact sheet. To add monitoring for chlorine to the NPDES. Chlorine would be used to reduce unexpectedly high levels ammonia. To add some aspects of OHA’s settlement agreement to the permit such as increasing surface water monitoring during April, May, and June for turbidity and Total Dissolved Solids from monthly to bi-weekly for monitoring sites SW-7, 8, & 9 downstream on the east side of the mine and at three sites on Marias Creek Rd. To add grease and oil monitoring for water in and out of the treatment facility, the lack of which was an oversight from the original permit. To add another round of chronic and acute testing since the first one was not conclusive. There was no disclosure of the impacts of increased chlorine on aquatic organisms. The public has a right to know the impacts of decisions before they are made. OHA asked that Ecology show that adding chlorine to the environment would be less harmful than other methods of reducing ammonia levels such as biological treatment, artificial wetlands or adding additional zeolites to the treatment facility. OHA also asked that an AKART (All Known and Reasonable Technology) be done. The engineering report for this NPDES modification was approved in February 2009 and included a modification of the point of discharge of Outfall 002 from the storm water infiltration pond to from a pipe at the top of riprap on the hillside above Gold Bowl Creek. Ecology had wrongly considered this change in discharge point a minor modification since the change has previously caused erosion and slope instability, in violation of permit limits and so not covered under 40CFR122.63. There was no documented justification or cause for not using the stormwater pond to infiltrate discharge of Outfall 002. The effluent failed the acute toxicity testing if any aquatic test organism has less than 80% survival in 100% effluent. The toxicity tests conducted in September 2008 showed no survival (100% dead) in 100% effluent. Based on these results, additional monitoring should have taken place but did not. The modification failed to include other provisions of OHA’s settlement monitoring that are west of the mine. According to the settlement agreement water quality monitoring similar to NPDES requirements will be conducted on SW-5, 10, & 11 also. OHA asked that these monitoring points also be included in the modified permit. Detection limits for a number of toxic metals were too close to, or in some case even higher than, relevant standards. OHA asked that these detection limits be lowered and included in the permit and monitoring reports. After more than three years of operation, ongoing issues continue to ebb and flow, such as some significant water quality challenges on Buckhorn that have corrective action in process. The annual coordination meeting to discuss Buckhorn Mine’s Water Year 2010 data took place at the Eagle Cliff Grange on the bank of the Kettle River on March 15th. Annual monitoring reports were submitted to the agencies a few weeks prior to the meeting. The purpose of the annual meeting is to review a summary of the previous year’s monitoring data, discuss the adequacy of monitoring plans and recommend any modifications that might be needed. OHA opened the meeting with a presentation of our analysis of the monitoring data, and followed up with a presentation and the independent review by Ann Maest of Stratus Consulting, which laid out our concerns regarding the company’s analysis. OHA also raised concern over contaminated mine leakage and offered suggestions to address the issue. OHA submitted a memorandum outlining changes to the Adaptive Management Plan we recommend and a list of actions that would improve the environmental reporting and performance of the mine. A separate memo was also submitted regarding Kinross/Crown’s failure to apply the required shotcrete to potentially acid generating (PAG) mine walls. Kinross began their presentation with an overview of how much they contribute to the community with jobs and donations and how much gold has been produced. Next, they provided an overview of the capture zone issue, the water treatment facility and surface and ground water quality. Prior to the annual reporting, Kinross adamantly maintained that the capture zone was effectively intercepting all mine contaminants. At the annual meeting, Kinross consultant, Golder Associates, presented quite another story. After rerunning the groundwater model, it is clear that four monitoring wells in the North Lookout Fault-3, east of the mine, are outside the capture zone and that it could take years for the contamination to dissipate. Mine contamination has also leaked west of Buckhorn into the surface water of South Bolster Creek. Adaptive management will continue to play a critical role in mining operations. In fact, some of the most important operational changes that have taken place over the past year are not included, or are minimally mentioned, in the annual reporting. For instance, the renovation and upgrade of the treatment facility has greatly improved effluent discharge, thereby reducing downstream impacts; however, it is not discussed in any detail in the annual reports. Unless the changes that have taken place are documented, future mine staff and regulators will only have a tangential understanding of how and why things are done the way they are done. This is an inadequacy of the Adaptive Management Plan (AMP). OHA recommended that a provision be added for annual reporting to include an explanation of the issues the mine has addressed over the year as well as the proposed or implemented solutions. Kinross and the agencies agreed with OHA that annual reporting will now include major changes that have been implemented at the mine, including an explanation of reasons for instituting the changes. The network of fractures throughout the mine and underlying the facilities are more extensive than previously understood by mine officials. Contamination from the underground mine, and likely the waste rock/ore stockpile, travels underground through interconnected faults, bypassing the dewatering wells and ending up in ground and surface water down-gradient from the mine. The increase in sulfates could indicate the start of acid mine drainage. Nitrates from blasting have increased to the west, south, and east of the mine. While the 2010 shotcrete inspection report failed to present the required volume and method of shotcrete application, it did reveal that additional faults exist, which have not been noted in any previous documentation. Understanding the location of new faults is well established as a critical factor in understanding the movement of contaminants. The Development Rock Management Plan (DRMP) provides procedures for identifying PAG rock to secure safe storage and disposal. Part of that process includes mapping the location from which PAG is mined. OHA suggested that the quarterly reporting of development rock characterization should be modified to include quarterly mapping of PAG locations and mapping of any fault and fractures that are identified while mining. These reports would be summarized annually. This modification was accepted. OHA also recommended that additional investigations of hydrologic pathways and faults on the mine site should be conducted. Studies could include additional pump tests, with response wells located across known or suspected faults; additional geophysical studies; and additional geochemical studies of water quality in mine sources and at stream and groundwater monitoring points. These suggestions are being considered. One very important aspect of the DRMP and AMP that is known to be highly effective has unfortunately not been implemented. Shotcrete inspection reporting reveals that only limited amounts of shotcrete were applied for PAG pacification last year and none in the previous year. Shotcrete is supposed to be applied to all PAG headings. For the last three years there have been increasing amounts of PAG rock and a corresponding greater amount of PAG headings. The application of shotcrete is not discretionary; it is a provision of the DRMP and AMP to be implemented because it would reduce the likelihood of Acid Mine Drainage (AMD). Shotcrete creates a reasonably effective barrier to prevent AMD, whereas backfilled cement does not create an effective barrier. Backfilled cement performs a structural function so that additional mining can take place, but does not necessarily form a seal. As a result, water that infiltrates around and through the backfilled cement rock has a high probability of eventually picking up contaminants and spreading the contaminants into the ground and surface water. Unfortunately, for the past two years, little or no shotcrete has been applied. Kinross says that from now on they will apply shotcrete but they still think that no shotcrete is needed if cemented backfill fills the mine-shafts. This is not acceptable. At the annual coordination meeting, OHA requested that Ecology require Kinross to go back and shotcrete all mine-shafts that contain PAG rock. Some of the shafts have already been filled with cement. OHA has asked that this cement be removed and shotcrete applied as required. The agencies will consider this request. OHA also requested that in the future, no cemented rock fill is placed until the PAG headings are properly sealed (shotcreted). OHA requested that PAG stockpile discharge monitoring occur monthly, a suggestion that will be implemented, as well as more often during spring runoff, which the company is considering. Kettle River Tailings Facility: There is a trend of increasing concentrations of nitrate, sulfate, and TDS in surface water; this should require Adaptive Management Plan action. 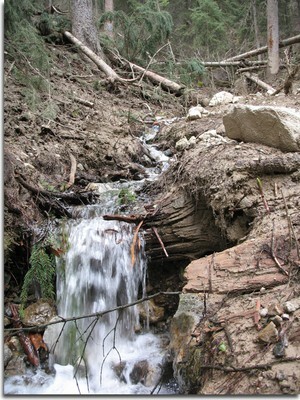 In May 2011, a large slope failure below the Buckhorn Mine sent a wall of mud and large trees flowing down Gold Bowl Creek. Just below the mine facilities and one of the treated mine water discharge areas, the side hill of Gold Bowl Creek gave way, sending mud cascading thousands of feet, uprooting large trees and scouring the creek drainage of all vegetation 12-15 feet high. Surface water monitoring site SW-9 was obliterated by the May 14, 2011 landslide. A replacement monitoring point was established at SW-9A. According to Geology (Chernicoff & Whitney, 2002), blasting that accompanies mining, quarrying, and road construction can trigger mass movement. Vibration from these activities can force apart grains of loose sediment, eliminating the friction between them. Sometimes human activity, such as mining, may combine with natural factors to increase the chance of mass movement. Crown/Kinross consultant Golder Associates performed a dye test to see if treated mine water discharged to the stormwater ponds DA 10/11 was connected to the massive mudslide that blew out the side hill of Gold Bowl Creek in May 2011, uprooting trees and scouring over half a mile of creek. In summary, the results showed that DA 10 contributed to flows in the slide area. OHA does not consider the DA 11 test conclusive because it occurred after the slide area had dried out. There was no flow by the time of the test. Ecology has curtailed treated mine water discharge to these locations. The National Pollution Discharge Elimination System (NPDES) states, “Discharges must not cause erosion or slope instability.” Crown/Kinross went to great lengths to represent this spring’s mudslide as unrelated to the mining activity. However, as noted above, a connection was established. As a result of landslides, two of the four treated water discharge points were restricted, and the company sought additional places to discharge treated mine water. Additional environmental review will be necessary to examine the impacts of discharging large quantities of treated water into yet unidentified locations, before the new discharge points can be permitted. It is in everyone’s best interest for new discharge points to be developed; otherwise, water builds up in the mine. The increases in nitrate and chloride concentrations in SW-14 made it apparent that a preferential pathway exists between the mine area and upper South Fork Bolster Creek. The mine has leaked contaminants since it began operations. The mine’s monitoring shows that the mine has failed to maintain a capture zone, which is supposed to keep mine contaminants out of surrounding ground and surface water. Recent water quality violations began with the spring thaw in May 2011, when a major mudslide erupted below one of the treated mine water discharge locations. The landslide released a 20 foot wall of mud, scouring the vegetation and ripping out trees for half a mile down Gold Bowl Creek. During May and June, water quality in Gold Bowl Creek exceeded standards for nitrates from blasting and sulfates from acid generating rocks. Sulfide rock removed from the mine is stored on the surface, exposed to the elements and can form sulfuric acid. Nitrates from blasting have also been elevated in Bolster Creek, west of Buckhorn, and in groundwater wells east of the mine. Unfortunately, discharges of pollutants have been occurring from the mine that are not permitted by the NPDES. In fact, the permit specifically states that no other discharges are permitted. However, contaminants from the mine and waste rock pile discharges have increased in ground and surface water, sometimes in excess of Water Quality Standards (WQS), and yet since April 2008, Ecology has not issued violations for failure to maintain the capture zone, nor for discharges from the waste rock pile. Throughout 2011, OHA continued to encourage Ecology to hold the company accountable for these non-permitted discharges. As part of the response to the Department of Ecology’s Administrative Order #8820, Crown/Kinross updated the Groundwater flow model for the Buckhorn Mine. OHA reviewed the Nov. 2011 Golder report entitled, “Updated Groundwater Flow Model and Mine Inflow Estimates,” and provided comments to Ecology. OHA found the report to be lacking coverage of some critical issues, including omission of grouting to minimize groundwater inflow to the mine and a lack of numeric estimates of groundwater inflow to the mine. Water leaching through development (waste) rock piles, especially in the spring, has increased pollutants in ground and surface water. Kinross is required to submit a report to the Department of Ecology each quarter to provide an analysis of the past quarter’s development rock information. Ecology rejected the 1st quarter report submitted in August and is requiring the company to generate a report based on criteria at that time. Crown/Kinross made commitments at the March 15, 2011 Annual Meeting regarding reporting of development rock, including mapping faults and applying shotcrete. No information about faults was in the quarterly report, and shotcrete application was limited. Contaminants travel through faults or other preferential pathways in the underground mine. Faults and voids in the cemented rock fill (CRF) are identified during mining. OHA had asked that these features be identified in the quarterly reporting to help track contaminant transport. OHA also suggested that increased shotcreting would increase groundwater protection. This suggestion comes as a result of failure of the capture zone, uncertainty related to seasonal fluctuations, and the unreliability of the groundwater flow model. OHA is concerned that the large backlog of PAG DRZ in the underground mine and the failures of the capture zone are degrading water quality around the mine. Cells where rock from the mine is placed for testing to determine if it is ore or waste rock, and if it is PAG. OHA also recommended that ore headings should be analyzed for acid generating potential and if it is determined to be PAG, the area should be shotcreted before CRF is applied for ground control. Until this point, it appears that ore has not been tested to determine whether it is potentially acid generating (PAG)! In the midst of these serious issues, the National Pollution Discharge Elimination System (NPDES) permit came up for renewal. An administrative extension was granted. OHA maintained that at the very least, the NPDES renewal should increase reporting during the spring freshet so that discharges from the waste rock can be more thoroughly monitored. In 2011, one downstream well was monitored once a month, which is insufficient both in frequency and scope to ensure that water quality changes during freshet would be noticed. OHA also strongly suggested that any increase in contaminants beyond the background baseline levels should be highlighted and watched for increasing trends, and all water quality violations should be noted. 2012 brought official recognition of the Water Quality permit violations, which were swiftly appealed by the company. On July 16, 2012, the Buckhorn Mine was fined $395,000 for water quality violations. The largest part of Ecology’s July 2012 penalty was issued for failing to capture and treat mine contaminants for 94 days, thereby violating the NPDES permit. According to OHA’s analysis, the capture zone has been violated since July 2008, for a total of more than 1,640 days. If a capture zone is not maintained, mine water can enter the groundwater system without treatment. Changes in water quality in stations downgradient of the mine indicate that the hydraulic containment system provided by the mine (capture zone) is not fully effective in containing mine water. Water quality monitoring data for South Fork Bolster Creek station SW-14 shows elevated concentrations of nitrite plus nitrate above background values in every sample collected since July 2008, which demonstrates that Crown has failed to maintain a capture zone on the west side of Buckhorn Mountain. The NPDES strictly forbids any discharges other than those that are permitted and there is no permit to discharge pollutants into Bolster Creek. Nitrates (Nitrite plus Nitrate, mg/l as Nitrogen) at the SW-14 monitoring point in the South Fork of Bolster Creek are significantly above baseline, indicating escape of contaminants outside the capture zone. The mining company appealed Ecology’s July 2012 penalty for permit violations at the Buckhorn Mine, denying responsibility for causing the Gold Bowl landslide and for failure of the mine’s capture zone. Crown challenged the amount of the penalties as too high. Despite the thorough documentation of slope stability problems below treated water discharge locations, and water quality problems below the waste rock piles, the company denied responsibility. There is not an exception written into the language of the mine plans allowing for some of the contaminants to escape the capture zone. 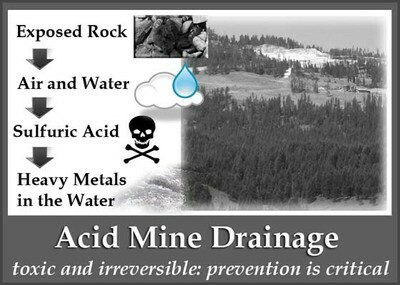 All contaminated water emanating from the mine should be captured. The monitoring program laid out in the AMP clearly aims “to determine… whether the mine and dewatering wells are creating a capture zone to contain seepage from the mine, development rock and ore stockpiles.” The plan does not call for partial containment of seepage. Based on the AMP, OHA has an expectation that Crown Resources will maintain a separation between contaminants generated from the Buckhorn Mine and the environment; however, contaminants are emanating beyond the footprint of the mine. Gold Bowl Creek cuts through sediment deposited by landslide, after the May 2011 slide below the mine. The appeals have since been settled. In 2012, OHA’s issues and concerns prompted numerous memos and letters to Crown/Kinross and regulatory agencies. OHA started the year in early January with a memo to Ecology, commenting on Crown’s consultant’s Updated Groundwater Model (Nov. 2011) and Crown’s response to Administrative Order 8820. After a thorough review of the details, OHA concluded that the report does not demonstrate that the revised groundwater flow model is calibrated to site conditions, nor is it capable of simulating mine conditions (such as leakage of mine-related contaminants to area streams). The revised model failed to simulate the effects of high precipitation and recharge in 2011, and the report has not adequately demonstrated that there is an effective capture zone around the mine. A revised report should be prepared that more directly addresses the success of model calibration and how shortcomings of the model can be improved. OHA wrote letters to and met with Crown, explained our problems with their proposal to discharge treated mine water into Gold Creek, and provided suggestions of analysis that should be done for last year’s annual review. Crown’s response was that if OHA wants this work to be done, we should do it ourselves. In February 2012, OHA prepared a memo showing that Crown has failed to maintain the capture zone, in violation of the waste discharge permit. The Shotcrete Evaluation is incomplete, lacks objectivity, and for consecutive years has failed to include basic DRMP (Development Rock Management Plan) and AMP requirements. OHA recommends that the 2011 shotcrete evaluation be rejected and that an independent third party submit a new evaluation. Discharge from the PAG stockpile should be monitored and reported for volume/flow and water quality monthly, with the exception of during spring runoff, when it should be monitored daily. Additional piezometers and monitoring wells should be installed to reliably establish the extent of the capture zone. An analysis of ground water elevations, precipitation and dewatering rates should be conducted to better predict the need for water treatment and underground storage. A new evaluation of geochemical predictions, influent quality and outflow quality should be conducted. In April 2012, OHA provided Ecology with a synopsis of the shotcrete requirements, including recommendations for enforcement. Shotcrete is a fine-grained cement that helps provide a barrier between reactive rock and preferential pathways to groundwater. Many of the requirements have either been ignored or only partially implemented by Crown. Annual reporting of operational changes should be required, including an explanation of each issue that has been addressed and the changes that have been proposed or implemented. Without a record of these changes, implementation of adaptive management cannot be effectively evaluated. Seeps and Springs: The 2007 AMP addresses impacts of dewatering on the Nine Acre Wetland. Operational changes designed to avoid further landslides have reduced or eliminated two effluent discharge points, leaving most effluent from the mine to be discharged into the Nine Acre Wetland. This AMP should be revised to reflect the current situation. Mine Dewatering and water supply impacts to streamflow: To provide mitigation of dewatering impacts, this AMP requires monitoring to determine whether the infiltration gallery is functioning properly, where water is returned to the soil. It appears that the “gradual increase of discharge” to the gallery was not adhered to, and in the absence of performance evaluation, its functions were compromised. This objective should be updated. Water Quality Changes Due to Mining Operations: Various adaptive management strategies have been adopted to mitigate water quality changes at the mine. The AMP should be updated to reflect the current situation, including increased analysis of data, action levels and mitigation strategies. Adaptive management for failure of the capture zone should be considered, including additional monitoring, analysis and remedial actions. Development Rock Management: The AMP should be updated to reflect the current situation, including increased analysis of data, action levels and mitigation strategies. These updates should consider actual water quality conditions, implementation of shotcrete requirements, and realistic assessment of discharges from PAG stockpiles. Slope Stability: Current monitoring and adaptive management of slope stability is ineffectual. If there is any doubt regarding this statement, the current monitoring plan should be evaluated in light of the 2011 landslide. The new AMP should provide for evaluation and management of slope stability. Also in June 2012, OHA provided Ecology with a memo regarding Crown’s mischaracterization of the 002 treated mine water discharge location. In October 2012, OHA commended Ecology’s regional director for issuing the penalty to Crown for violating their permit and provided additional examples of provisions that have been violated, including failure to notify Ecology when monitoring values exceeded background values. Okanogan County is host to 124 of the 155 butterfly species recorded in Washington. Caitlin spoke about some of the eco-geographical aspects that contribute to this incredible diversity, what species you can expect to commonly find, and some of the more reclusive species to watch for. We also learned how to contribute to ongoing research by photographing and recording data through various methods. 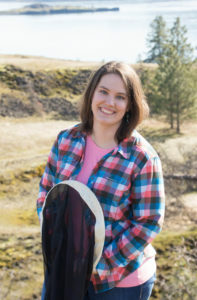 Two of Caitlin’s books were available for purchase: Butterflies of the Sinlahekin Wildlife Area and Pocket Guide to the Butterflies of Washington, both of which were used as part of OHA’s 2018 butterfly field trip. The bumble bee field trip on June 22, 2019 will provide community members with an opportunity to learn about the bumble bee species in our area, their importance to our ecosystem, as well as ways we can help conserve them. 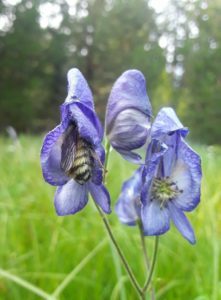 In an effort to learn more about bumble bees to improve evidence based bumble bee conservation guidance, the Xerces Society for Invertebrate Conservation, in partnership with the Washington Department of Fish and Wildlife, Idaho Department of Fish and Game, and the Oregon Bee Project, has launched the Pacific Northwest Bumble Bee Atlas. On a hike in the Okanogan Highlands, Rich Hatfield, Xerces Society conservation biologist, will share information about the Atlas Project, how to participate, and the value that the project will have to our area, both locally, and more regionally. The goal of this field trip is to connect the community with the contributions of our native bumble bees and other native pollinators and provide inspiration and a user-friendly method of engagement in a citizen science making positive strides toward effective conservation. One indicator OHA uses to measure change over time at our restoration sites is the migratory songbird population, using a timed point-count method for one morning in late May or early June. If you have bird identification skills you would like to share in our annual survey, please contact julie@okanoganhighlands.org. We hope that as the habitat improves, it will be capable of supporting an increasing diversity of bird species! See below for photos from the event at Myers Creek over the years. Thank you to all the volunteers who have contributed to this important effort since 2011!